Have you ever wanted to buy an album but cut out the annoying filler? 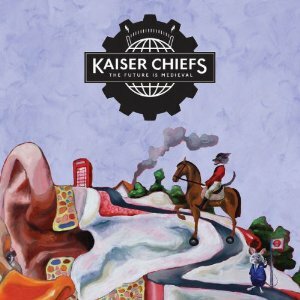 Kaiser Chiefs have given their fans a chance to cobble together the ideal album on their website, offering up twenty songs that can be arranged and purchased, even resold for a profit. It’s an interesting concept, but is the material worth it? And with such freedom of choice, should anyone bother to buy the physical release with a set tracklist? The short answer to both is yes. Gone are the repetitive choruses filled with “oh”s and “na”s that made the band famous, replaced instead by a sound that’s still catchy but more reminiscent of the 80’s. Nothing stands out as a booming single, but for the Chiefs, that just means that the tracks are on an even playing field. Definite keepers on the official tracklist are the Bowie-infused “Man on Mars” and the poignant paternal ode “If You Will Have Me.” “Child of the Jago” has toned down hints of their original sound, while “Heard It Break” is surprisingly synth-based and retro. Having said that, I would recommend building your own album just for the songs you can’t get on the official release. “Can’t Mind My Own Business” has a stomping beat and provides a great singalong and “Cousin in the Bronx” is just a slice of pop rock fun. However you splice it, you get the album that you want, so there’s no excuse for putting the iPod on “shuffle” for this one. Make it your own since there are certainly at least ten tracks for any indie soul to enjoy.